This apartment has just been completed. 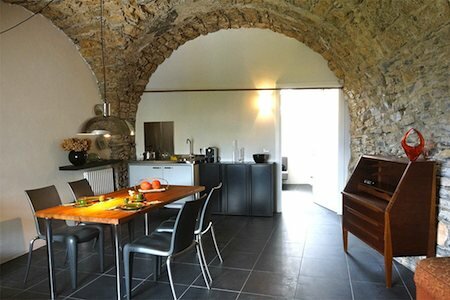 The continuous and complete restoration of the entire building over several years has created an exciting contrast of top-modern, open architecture with original ancient stone walls - the restoration was realized with refined materials of excellent quality. The apartment, which offers 65 sqm net living area, is comfortably located on one level: In the center there is the 25 sqm large living room with dining area and open kitchen with an impressive vaulted ceiling, which has been exposed. From here you get into the studio with a sofa bed for 2 persons. Adjacent to the left there is the bedroom for another 2 persons; in total the apartment is suitable for 4 persons. 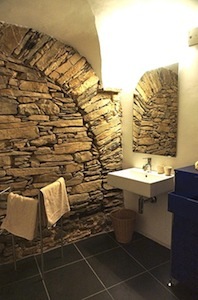 On the right a comfortable dressing room leads into the bathroom, which also impresses with ancient stone walls. The garden of approx. 500 sqm is located in front of the entrance to the living area (separated by a small footpath), where a solarium terrace has been created. The garden with some herbs, oleanders and a lemon tree enjoys a wonderful view of the unobstructed hills down to the sea. The picturesque mountain village Lucinasco, part of the historical heritage, is located on the southern foothills of the Maritime Alps. There is a cosy restaurant, a small grocery shop for daily needs, as well as some historic churches, one of them situated right next to a picturesque lake. Lucinasco is a popular starting point for excursions into the fantastic landscape for hikers, bikers and motorcyclists. The village is situated 500 m above the sea level and surrounded by ancient olive groves, about 17 km away from Imperia, a city with two different districts: the busy Oneglia with all kinds of shops and the picturesque Porto Maurizio with its pier and beautiful beaches.